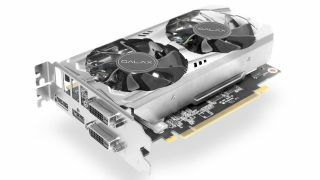 We’re seeing more cut-down Pascal-based graphics cards designed to fit in small PC cases – the sort that can happily sit in your living room without seeming an eyesore – and Palit has just launched a new GTX 1070 model under its Galax brand (and an identical card under a second KFA2 brand, which, let’s be honest, loses out in the ‘cool name’ stakes). The Galax GeForce GTX 1070 OC Mini is built to suit Mini-ITX PC cases and it’s 195mm long, which is slightly trimmer than some efforts we’ve seen (such as Zotac’s GTX 1070 Mini which is 210mm). You get the same level of power as a full-size GTX 1070 card here, with the core specs including a base clock of 1518MHz with boost to 1708MHz, and 8GB of video RAM on board. The card has a TDP of 150W and requires an 8-pin PCIe power connector to be hooked up from your PSU. As for cooling, Palit has included three heatpipes and dual 80mm fans (it also boasts an anodized aluminum backplate, which helps on the aesthetic front). The company claims the GTX 1070 Mini idles at around 34 degrees, and under full load reaches around 74 degrees. For connectivity, you get a DisplayPort 1.4, HDMI 2.0b, and a pair of dual-link DVI-D connectors. It’s not clear exactly when this model (or the KFA2 brand) will show up on shelves, or at what price, but we shouldn’t have to wait long to find out. To give you some idea, though, the aforementioned Zotac 1070 Mini will set you back around £395 ($395 over in the US – that’s around AU$515).